OCEM’s American affiliate company, Multi Electric, is kicking off its next century of quality and innovation in airfield ground lighting with a major rebranding effort. The new company identity, Multi Electric-OCEM Airfield, reflects a closer relationship with Multi’s parent company, the OCEM Airfield Technology Group, and its renewed investments in research and development. 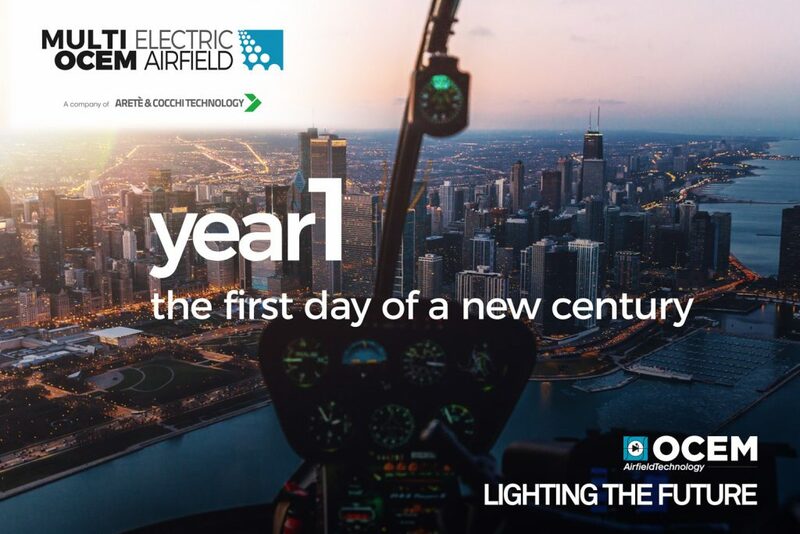 Founded in Chicago, Illinois, in February of 1917, Multi started out in wiring components and street lighting before becoming one of the first American producers of airfield ground lighting when commercial aviation took off in the 1960s. Meanwhile, in Italy, OCEM was pioneering European AGL solutions thanks to its acquisition of Buini and Grandi, founded in 1921. OCEM acquired Multi in 1999, and together they were among the first companies in the world to incorporate long-lasting, energy efficient LED technology into their raised and inset lighting signals. Now, Multi is enjoying a renewed commitment from OCEM — including investments in personnel, R&D and manufacturing — to usher in the next generation of smart, efficient lighting signals and control and monitoring systems. The newly strengthened partnership will bring OCEM’s cutting-edge R&D to a company that boasts strong partnerships with key transportation agencies in the U.S., including the FAA, Air Force and Navy, and New York-New Jersey Port Authority, and has long served as OCEM’s entre into the North American market. The OCEM group also includes Augier, a French company specializing in power transport that was founded in 1954. These acquisitions allow the OCEM Group to provide fully integrated AGL solutions: Lighting Signals, Telecontrol Systems and Constant Current Regulators. To find out which OCEM solution is right for you, contact a sales representative today.